TEAM UP FOR A TOUR OF THE LONE-STAR STATE WITH THE BOOTSY COLLINS FOUNDATION! State-of-the-art mobile recording studio & HD production facility brings mission to keep music and arts education alive to Texas! The John Lennon Educational Tour Bus is excited to announce a series of dates in the great state of Texas this week! Beginning June 16th, the Lennon Bus, a non-profit state-of-the-art mobile recording studio and HD video production facility will be on tour with funk legend Bootsy Collins and the Bootsy Collins Foundation. While parked at each venue, the Lennon Bus will provide local students with the chance to come aboard and create an original music video with assistance from members of the band. Events start in Houston on June 16th at Warehouse Live and continue on June 17th in Dallas at Palladium Ballroom and June 19th in Austin at Austin City Limits Live at The Moody Theater. Bootsy Collins is a dream collaborator for The Lennon Bus. In 2010, Collins started the Bootsy Collins Foundation, a charity that aims to promote learning by offering chances to experience life through music programs and career opportunities. Collins believes that learning to play a musical instrument can be a transformative experience in students’ lives, a value The Lennon Bus holds dear. With a mission statement that promises to “Say It Loud An Instrument For Every Child,” the foundation focuses on providing a means of reaching youth, teens and adults through fun, constructive musical and educational activities - instilling the confidence and character necessary for them to grow into productive members of society and become responsible adults. Collins has even started his educational program called Funk U. For more information go to http://www.thefunkuniversity.com. Collins rose to fame with James Brown in the late 60s as a bassist and singer/songwriter. In 1972, Bootsy joined George Clinton’s Parliament-Funkadelic. During that time, Collins’ driving bass guitar and humorous vocals established him as one of the leading names in funk, and one of the main reasons for his inclusion in the Rock and Roll Hall of Fame. The John Lennon Educational Tour Bus is a non-profit state-of-the-art mobile Pro Audio and HD video recording facility that provides hands-on experiences for students of all ages. In its 14th year of touring, the venture is proud of its fully professional bus and its studios, which boast the latest audio and video technology, gear and products. The concept began as an offshoot of the John Lennon Songwriting Contest, which is dedicated to providing opportunities for both professional and amateur songwriters around the world. 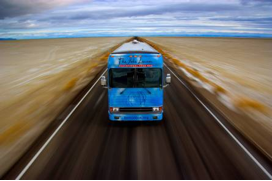 The bus travels across the U.S. and Canada year-round, providing free tours and workshops at schools, retailers, festivals, major industry conferences, and on tours with headlining artists. The Bus, a 501(c)(3) venture, is made possible through the generosity of sponsors including Apple, Avid, Mont Blanc, NAMM, SAE Institute, Gibson, Epiphone, Neutrik, Sony, Audio-Technica, Sonicbids, Musician’s Friend, Music Player Network, Sonicbids, Litepanels, Reflecmedia, Disc Makers, Mobile Roadie, Ampeg, Roland, Boss, Mackie, Digital Media Academy, Aphex Systems, Apogee, Manfrotto Distribution, iZotope, Glyph Technologies, Harris Corporation, Applied Acoustics Systems, Antares, McDSP, IK Multimedia, Adobe, Native Instruments, Slingerland Drums, Noise Industries, and Mad Mimi. The John Lennon Educational Tour Bus is made possible by an agreement with Yoko Ono Lennon. Avid creates the digital audio and video technology used to make the most listened to, most watched and most loved media in the world – from the most prestigious and award-winning feature films, music recordings, television shows, live concert tours and news broadcasts to music and movies made at home. Some of Avid’s most influential and pioneering solutions include Media Composer, Pro Tools, Interplay®, ISIS®, VENUE, Oxygen 8, Sibelius, System 5, and Pinnacle Studio™. For more information about Avid solutions and services, visit www.avid.com, del.icio.us, Flickr, Twitter and YouTube; connect with Avid on Facebook; or subscribe to Avid Industry Buzz. Avid, the Avid Logo, Pro Tools, Sibelius, Media Composer, Interplay, ISIS and Pinnacle Studio are trademarks or registered trademarks of Avid Technology, Inc. or its subsidiaries in the United States and/or other countries.